Brush Clearing On A Residential Property. 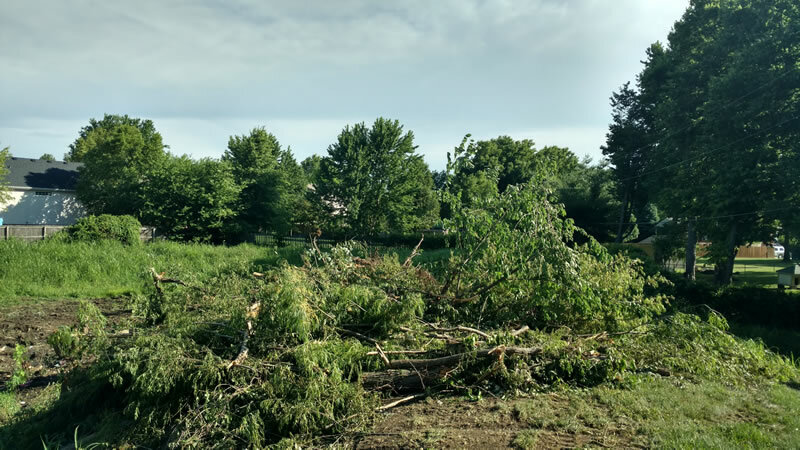 Cleaning up a neglected or overgrown property can be a big project. If your property has been neglected for a few years it can be a daunting task to get it back into a manageable state. Overgrown lawns, weed growing out of control in the garden beds, trees, hedges, and shrubs that need trimming, organic debris removal, and more. Depending on the size of your property it could easily be a full day project or in some cases, multiple days to get your property back under control. Has your property been neglected for a few years? You are embarrassed by the appearance of your yard? Are you an absentee home owner and need seasonal clean ups? Do you need to clean up a property that has been neglected by renters? Are you trying to get your home ready to sell? Green Acres Lawn & Landscape is a licensed and insured Kansas City landscaping and lawn care company that specializes in neglected and overgrown property clean ups. Whether you need a few garden beds cleaned out or your entire property needs a good clean up we’ll be able to get your property back into a manageable state again. If you have garden beds that have been neglected and are out of control it makes a dramatic difference in the appearance of your property when they are cleaned up. Our garden bed clean ups include removal of weeds, leaves, and organic debris. We can trim and shape all of the small trees, shrubs, and bushes, when we’re done with the clean up we can spread new soil or mulch to give your garden beds a nice and neat uniform appearance. This is an affordable project that will improve your curb appeal quickly. If your property has a large amount of brush that is cluttering up your usable land we’ll help you reclaim it! As part of our yard clean up services we can knock down brush and remove it from your property. You’ll end up with more usable space and a property with increased curb appeal. If you’d like to schedule an estimate for your yard clean up please give us a call (913) 422-5111 or fill out our online contact form and we’ll get back to you right away.